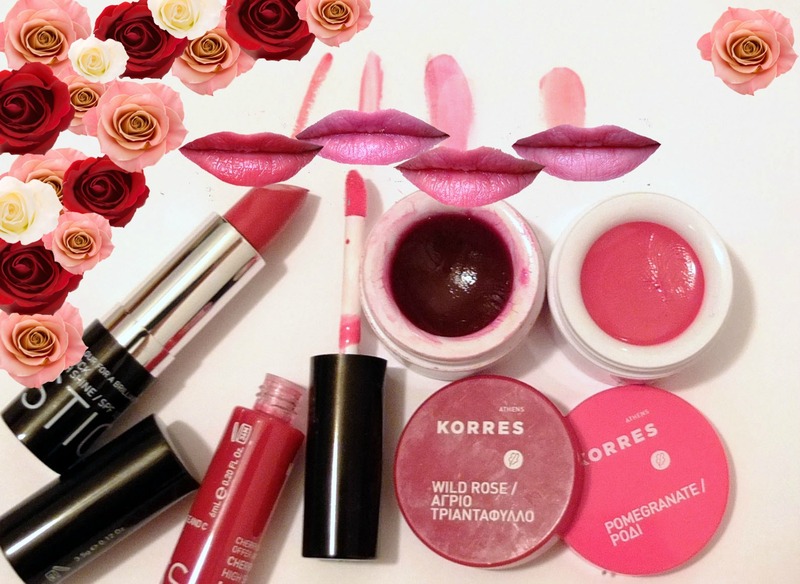 I am obsessed with Korres…. Oh, did you not know? Well I am, and I have mentioned it several times! With Valentines Day coming up I thought it would be a dandy excuse to crack out a few of their lip products and you know, milk this seasonal event for all it’s worth. Obviously Valentines Day is all about roses, pink, red, generally soppy nonsense. But these products aren’t only pretty colours but also pretty darn good all round lip staples too! Lemme break all down yo…. First off, can we just have a little moment to appreciate my mad photoshopping skillz below…..
Now we’ve soaked that up and realised that they are infact lips on the picture not vajayjays (yes almost had a photoshopping faux pas when I was going to edit them to be side on!) let’s have a little looksy at these colours. We have some classic rose, pink and a slightly orange loveliness bestowed upon us from the swatcheroo’s below. From Left to Right: Korres Mango Butter Lipstick in Orange Red, Korres Cherry Lip Gloss in Red, and 2 x Korres Lip Butters in Wild Rose and Pomegranate. Now I must say, when I opened the Orange Red Mango Butter lipstick, I thought it would be pretty grim. It looked like a horrid colour and reminded me of the mid 90’s. But when I applied it I actually LOVED it. It’s a really subtle orange tone with a dominating redness. It smoothed on so nicely and left my lips feeling really moisturised and soft, colour staying power was also impressive! The Cherry Lip Gloss was also a massively pleasant surprise, at first I thought it would be sticky, awkward, not last very long. But the product we actually have is something very similar to the Wild Rose Lip Butter, but in a much handier form!! It’s not sticky and the colour is sheer which adds a hint of redness. It smells like actual cherries which is delicious to boot! I think this is my new favourite of the bunch. As I’ve mentioned before (and you’ve probably seen on thousands of blogs) the Korres Wild Rose Lip Butter is my holy grail product of 2012. It’s a wonderful lip product and if you dig around my blog you’ll find a review somewhere. The Pomegranate Lip Butter is just as brilliant but the colour pay off isn’t quite as splendid. It’s more creamy also as the Wild Rose Lip Butter tends to be a lot more translucent, it’s kind of like the different between cream of tomato soup and a standard tin of tomatoes (I don’t know why that’s the only thing that sprung to my mind then?). The colour doesn’t last quite as long but as it’s creamier you feel like it’s moisturised a lot deeper. The prices for these products range from around £6 to £13 so all great value for money even from a right wod like myself. And whilst I’m on the subject of Korres I’ll share the competition I’m hosting with them on the Lady Boys of Bangkok Facebook page. It’s to win an exclusive Valentines Gift Set which contains the aforementioned wonder product, the Wild Rose Lip Butter, alongside some of the Japanese Rose bath and body things. It’s pretty swanky and the closing date is in the few days. It’s a free competition to enter and open to UK residents only (full details here), but make sure you like the page anyway because I’m planning some awesome stuff for the ‘Fifty Shades of Pink’ tour coming up in 2013! Get on it like Sonic yo!